The Macro Sensors RSE 1500 series of contactless, fractional-turn, absolute output rotary position sensors are ideal for measuring the position of quarter-turn valves, flue dampers, weir gates, mail sorters, conveyor check weigher systems, dancer arm tensioners, and myriad other applications involving fractional-turn shaft movements. They are also useful for high reliability applications such as pedal, throttle-lever, or actuator position sensing in aircraft, marine, construction,and agricultural vehicles. RSE 1500 series sensors provide an analog voltage output proportional to shaft rotation over a total range of 120&°. They utilize built-in electronics offering DC input/output configurations and are available for 0 ° to 30 °, 60 °, 90;°, or 120 ° rotation ranges with a true 0-to-10 V DC unipolar output. Normal electrical I/O termination is a 5-pin M-12 connector receptacle, but on special order for OEMs other connectors or cables can be supplied. Please contact the factory for more information. RSE 1500 series rotary sensors are enclosed in a 1-1/2 inch diameter anodized aluminum shell, and have a 0.250 inch stainless steel shaft running in high performance ball bearings. 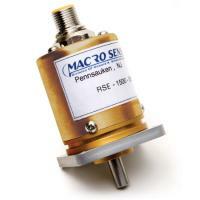 Mechanically, all RSE 1500 series sensors are full 360 ° rotation devices. The sensors' measurement range is referenced by the alignment of the flat on the sensor's shaft, perpendicular to a witness mark on the face of the mounting pilot. In this position, the analog output increases when the shaft is rotated clockwise as viewed from the shaft end. The absolute output characteristic makes the RSE 1500 series superior to incremental output sensors like optical encoders that lose their position information in the event of a power failure. Input Power: 13.5 to 26.5 Volts DC 25 mA max. 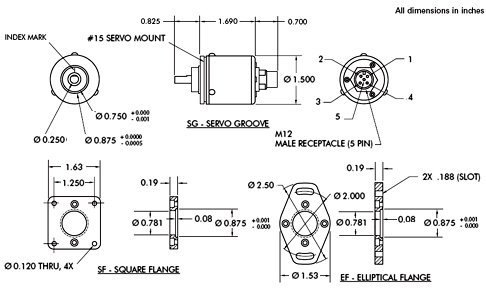 Ordering Information: Order by model number followed by range designator and flange type (SG - Servo Groove, SF - Square Flange, EF - Elliptical Flange).